Introduction to myself and my lovely team! I am passionate about my business and have always been inspired by florist trends and fashions-this has been essential for us always to remain one step ahead of the opposition. Blowing my own trumpet a bit… I happen to have a Gold Medal from the Chelsea Flower Show, and trained for 5 years and have the highest florist qualification, National Diploma of the Society of florists. With under 30 years experience under my belt, I think I might just be getting the hang of it now!! 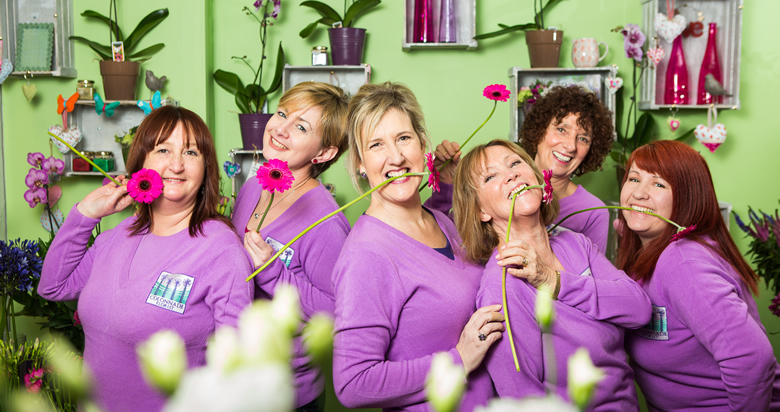 However the Colonnade florist would be nothing without my excellent team that work alongside me at the shop, and we all have our strengths to bring together a good mixture of talents. Jan is my bubbly manageress, she has been in floristry for as long as I have, 30 years!! How is that even possible, as we only look 21 ourselves? Not only does Jan keep an eye on everything that goes on in the shop, she does most of the daily flower buying and also runs the very busy funeral side of the business. The designs that she has created over the 15 years that she has been at Colonnade, have been breath-taking. Rita is my wild and crazy German colleague, she is in charge of making the shop look exciting, putting her European ideas into action daily. It never ceases to amaze me how quick and talented she is. Rita qualified in Germany, worked as a florist all over the world and has been with me since 2003. Kelly joined us in 2015, and it is great to have her on board. We trained together 30 years ago, and have been great friends ever since. Her bubbly nature and ability to do anything at top speed is a huge asset to our team. Kellys experience and skill on funeral tributes is excellent and is always praised highly by our customers. Maggie is one of our delivery drivers. It is Maggie and Tony, and Mark's jobs to deliver the bouquets daily to all of the lucky recipients. We deliver all over Tunbridge Wells and the surrounding areas. 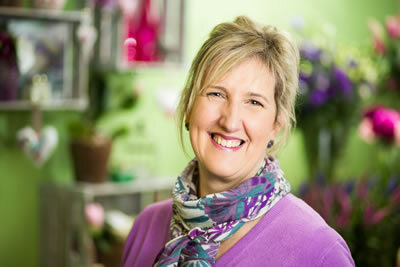 Maggie is always smiling and she is a real ambassador for Colonnade Florist. Tony has been a florist for nearly 50 years!! And he still only looks 40… more recently he has taken a back seat from the floristry to be the other half of the delivery duo! He has an amazing memory and can remember delivering to a house that he delivered to 5 years ago! Tony is my ex hubbie, and it was with him that we gained the medal at the Chelsea Flower Show. Linda has recently joined us in July 2015, and has proved to be a great asset to our team. 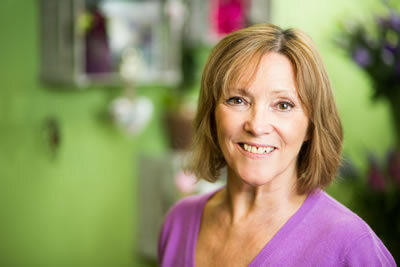 She has been a florist for many years and is fully trained in all aspects of the trade. There is nothing that Linda cannot turn her hand too, and we are pleased to have her with us. is the youngest member of Colonnade, until recently Charlie worked as a receptionist and she used to look on with interest at the corporate flowers being delivered to her office. Not really enjoying her job, she decided to re train as a florist and I am very lucky that she chose to join our team.Charlie keeps all of our Social media posts up to date. She is hugely talented young florist, and is going from strength to strength with her skills. It is quite likely that it will be Charlie’s professional , soft voice that you will hear if you call to place an order. Is our second delivery driver, and works every day to help Maggie and Tony.He also happens to be my lovely brother in law.